At the beginning of this year I upgraded my DAW with a new Alienware I7 Quadcore PC and my software to the new Steinberg Cubase Pro 8. I am loving it to! I have been using Cubase now since 1990 and the days of the good old Atari putor’s. This one is the best version yet, Steinberg now have the backing and benefit of the Yamaha music group behind this next generation virtual studio technology. So a music tech marriage made in heaven between the Cubase software brains and the Yamaha hardware interface, will lead to further integration into the future with innovative new digital work surfaces and controllers. For the time being I will have to settle with my brand new Steinberg UR22 Audio Interface, which does the job superbly, with as high quality sound as you might need. The first major project of the new set-up was a slight divergence to the normal musical production and it came as a refreshingly different and pleasant surprise. Ella Jo Street who I have recorded music for in the past , asked me if I would record an Audiobook of one of her kids stories. I was a bit dubious at first, although in the past I have recorded spoken, plays for the radio and podcasts. Anyway we ran through a dress rehearsal of the 6500 word story and I recorded it onto an MP3, it played back at around 50 minutes and in places it was hilarious with EJ Street finding great character in her performance. I also recently acquired a Rhode NT1A microphone, so after a bit of tweeking EJ and I decided to record the story again , this time obtaining a top quality sound and putting some thought into Foley and other sound effects. We set up the environment with a dampened space away next door, ran cables under doors, set the laptop up on the table for a text read out. Then we sat EJ down comfortably , with headphones, with talk-back. I set up the phantom power on the UR22 and set up the recording levels. I set up a number of Audio channels on Cubase, which I set to run at 24bit and 44.1khz, we did a few test takes until we were happy. Then we started. We ploughed our way through the first 15 minutes before we listened back. We were largely really happy with the take, the sound was good, the performance was excellent, EJ had really done her homework on the characters voices.. The only things we needed to touch up later was a slight volume adjustment I had to make as it was recording some three minutes in. I had to compensate for this in the post production process. Once the new level was set, it was good for the recording of all the following narrative. Later we went back and replaced the continuity headings narrative. As time wore on however, EJ tired quicker so we ended up doing more takes, which I knew would have to be edited later. I didn’t want EJ’s voice to give either before the end of the reading. So we stopped for a cup of tea break. Had a listen back to the work so far, hey! It was sounding real good! We returned to finish the second half, which in fact turns out to be more or less an hour long. EJ needed me to rewind a couple times to check her character voices were right, eventually we got to the end. A great performance but some serious editing was needed to edit the different takes into the right order. I literally had to follow the text and check every line whilst editing, which I needed to do right away, whilst fresh in my software memory! After a few hours of editing I had something to play EJ for her to check, she spotted an ‘audio typo’ or two , we put it right. Set up a soft limiter and slight eq on monitors. We ready for the next stage. This is where we were to have fun! “Barney The Musical” is a story from Ella Jo Street’s “A Witch called Gwubbin’s” series aimed at kids between 4 and 11 years. 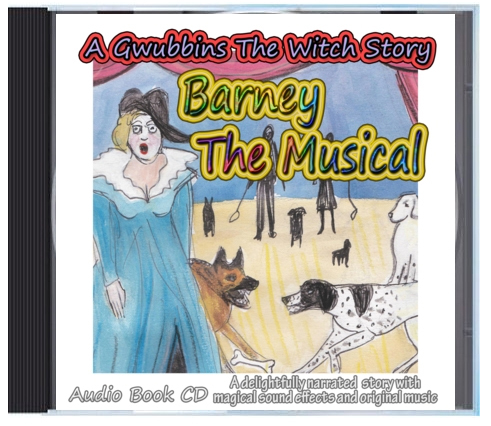 Gwubbins creates magical spells with the best of intentions , but the spells go hysterically wrong leaving her visiting actress sister Alidusta from the end of the universe and her dog Barney in ‘pandabonium’ in a stage musical. We decided we would make an audio book to remember. As this was a musical we decided that we must depart from a normal narrative (Like most audiobooks) and add some bespoke ‘musical’ songs. 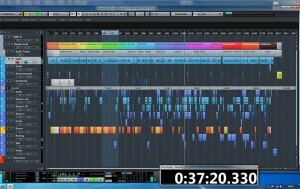 So how would the new Cubase Pro 8 cope with an hour long Audiobook with foley and music? On another project we started work on the bespoke musical pieces. This was to involve lots of practising of scales, donkey honking, yodeling, murmuring, whispering. We needed to create the sounds of wonky contraptions, magical broomsticks, dogs barking and running riot. Using Halion SE I created an Orchestra on different layers and created a loop on one idea. On another we needed a kind of fanfare so I used the same orchestral multi-timbral in Halion, eventually creating four or five pieces . Once reasonably happy I suggested EJ write some lyrics. In the story she mentioned a few songs for instance “The Dog Show Cabaret”, “Howling Moon Blues”, “Winner by a Whisker” and “Barney in my Dreams”. Very soon EJ had four short songs to work with, so I got her to drop the vocals onto each of the songs. What a fine job to! She got into full operatic character and before long we were creating mini mixes to slide into the main book. So we were now armed with most of the sounds and Foley we needed to create our masterpiece! It was just a case of layering on different tracks, using the new ‘REVelation’ Reverb hosted in Cubase Pro8, I found a general theatrical ambiance for the live on stage stuff. Later we played about with the different characters voices, the elf for instance we transposed up and layered, the magic spells needed a peeling harp and bobs your uncle, there were many other treatments, that all hopefully augmented to a well put together story that is all but graphically animated! “Barney The Musical” is a kids story at the end of the day, it is kids that it is meant for however in places it reminds me of Sir Henry at Rawlinson End , or Jeeves and Wooster or something similar. This is not a regular audio book in the true sense, it is a listening experience par excellence! I do have a serious grumble about Cubase Pro 8 however. Most songs that one might want to record are never more than a few minutes. However with “Barney The Musical” being over an hour long , it did manifest a peculiar problem that made it very difficult to work with. 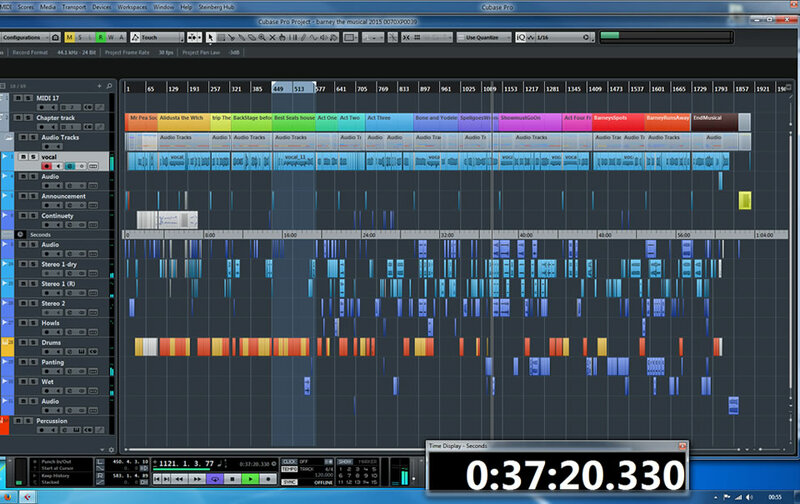 As more tracks piled up over the narration with different sound effects and some control changes, editing got slower and slower. Yes I agree it was a very huge song! But I would have thought Cubase should have coped admirably but it let me down! Everything was fine when editing near the beginning of the material but after about a third of the way through, editing took longer and longer the nearer I got to the end! At the end each edit would often take as long as two minutes to perform, a real pain in the neck that slowed the work down significantly. I took time out to read the manual and help sections , I tried various setting changes in the audio devices pages. I turned down the ‘undo’ in fact I spent several hours trying to track down the problem. I went online to the Steinberg Cubase forums and tried several searches for others that may have had the same problem. I did find a couple of leads, like turning of the ‘auto-hit detection’ in the preferences (It’s on by default) I removed all of the hit-points which were totally unnecessary in audio book narrative material anyway. There was one tantalising thread that sounded just like my problem but no-one had got back with any answer , so I still don’t know if it’s an inherent problem with the new Cubase Pro 8 or whether it is a setting somewhere! If i am going to use Cubase to create any more audio books I am going to have to nail this problem. When I get a chance I will address the forum with it. version…such and such…”fixed…..anomalous timing discrepancy” and sure enough it was fixed! All of that time wasted, hours of trying to track down, the disgruntled customers, the heck! The fault lay in the software all the bloody time! Since then my lesson learned is to never jump in with brand new software, let someone else be the guinea pig. So after a few sessions we now have our first audio book. There were many lessons learned in the creating of Barney The Musical, now it’s onto the packaging, marketing and promotion. It will manifest both in a CD form and digital versions. We have plans for more audio books now, I will have to nail the Cubase problem, but I am sure that will be fixed very soon. All new projects are likely to have teething problems, it’s part of the learning process. UK Decay, Furyo and In Excelsis were gone but in their wake, the town of Luton still had a bustling ‘alternative’ scene in the mid eighties. At the time, Click Click, Karma Sutra, the Party Girls, Penumbra Sigh and a host of other acts were ‘wooing’ the local audience’s. Click Click were pioneering new industrial sounds at their Lung Function HQ and Karma Sutra were flying the flag for the ‘anarcho-pacifist’ movement. Both bands were regularly playing gigs out of town and around the country, even playing in Europe by 1986. Thatchers government made great issues to protest against, we had seen the Falklands adventure, the Miners strike. So in 1986 when it was announced that an old WW2 supply base near Elstow in Bedfordshire was to be the host of the nations nuclear rubbish dump, it was decided that something had to be done to stop it. The focus for the towns alternative community at the time bedside’s the obligatory ale houses such as the Blockers Arms and The George, was the 33 art centre in Guildford Street. A three minute walk round the corner in Bute Street was situated the printing workshop. The upstairs rooms hosted Click Click’s ‘Lung Function’ – rehearsal rooms for bands. Both ’33’ and ‘Lung Function’ provided rehearsal spaces and acted as informal gathering and networking havens. So ideas, pre- internet days, would spread quickly. 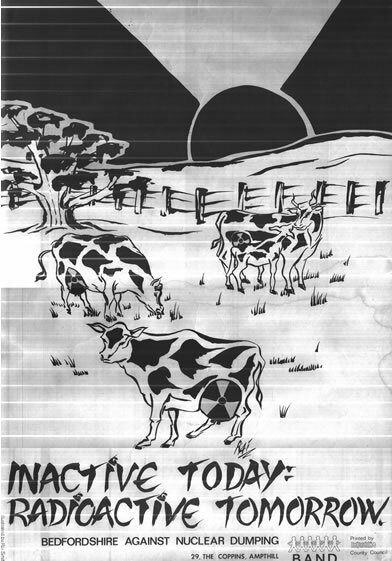 Most of the towns young ‘alternative’ musicians got behind the idea quickly and very soon the idea of a protest – compilation tape would be in order. 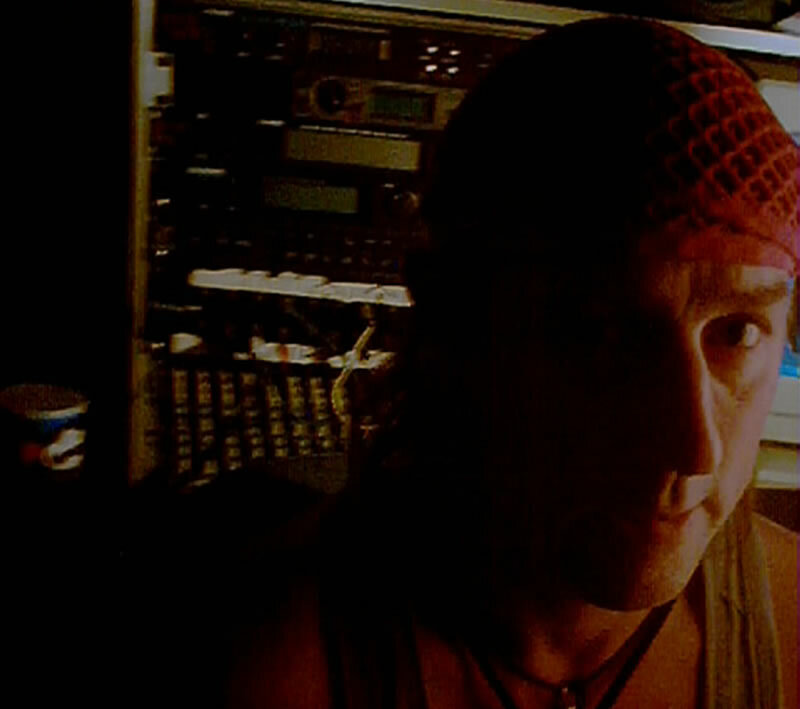 Bands and individual musicians were asked to contribute a specially written and recorded song or two, protesting against the Governments nuclear agency – Nirex. In the mid Eighties Government Policy determined that a site in mid-Bedfordshire near Elstow, was to become the main national and an international Nuclear-waste dump. Play whole selection in windows media player. Profits from the project were to..
Ironically it tuned out that soon after the tape was released, the government dropped their plans for Elstow, the whole country at the time was up in arms against the nuclear industry! So victory for the aims of the campaign and reason for the tape, by default! This may have taken the wind out of the sails for the project at the time but today this collection stands as a historical snapshot of Luton’s alternative musicians, community and culture of the mid-late eighties. 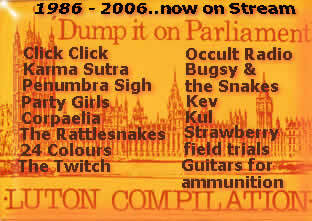 In 2004 one of the original artists to have appeared on the tape, Bugsy – digitised and sent the UK Decay Com website the MP3’s to host, which we have hosted to this day, now twenty five years after it was originally released. In 2006 Spon re compiled and remastered using another recently found copy of the original, selecting the best quality to have survived the years of each track on the tape. So thanks go out to Bugsy, Spon and Ella Jo for the BAND poster and of course all the bands and artists that contributed to this historical and unique Luton collection. Some notorious Luton Punk venues from the 70’s and 80’s. Some notorious Luton Punk venues from the 70's and 80's.